I am a career woman in management for a large medical equipment company. I am definitely type A and loving it. I am the main bread winner for my family and it works for me and my husband. I am a mother of a young man who is experiencing a challenging stage in his life. I am very involved in my Spiritual Community. When my son was 13, I started a teen group in our church which has grown and blossomed. I work out 3 times a week with a personal trainer and it is invigorating. I’m writing a book that I work on while waiting for trains, planes and automobiles. I travel extensively to work with my sales representatives from Maine to South Carolina. Exciting, strenuous, interesting, and very demanding, but I love my job and compensation that I earn. Life is good. And then it all changed. It begins at a National Sales Meeting in Boston staying at the Liberty Hotel. I flew in on Tuesday evening, the day before my birthday. Sales meetings are an oasis for those of us who work from home and travel for career. I have been working with many of the colleagues for 20 to 30 years. So this meeting is “going home” in my working life. A time to be with dear friends, who are also stars in the sky of medical sales. I am in the plane and start to feel off, unsettled and a bit dizzy. This never happened before so I close my eyes, anticipating a speedy recovery which never occurs. I arrive at the hotel, and go straight to my room. At this point, I would normally unpack my suitcase and organize my clothes and toiletries. This particular evening, I’m unable to follow the usual protocol. I lay on the bed, anticipating an enjoyable meeting with the usual daily workshops and speakers, followed by fabulous dinners and dancing. Much to my dismay, my rest had no positive results. I push through the pain slowly forming in the top of my head and circling down my neck. I dress for the reception and dinner. I excitedly go down to the reception and see that my friends have a table for all of us, to converse and laugh and eat! I sit down with the pain foremost in my mind and I barely partake of the buffet which is a culinary delight. After 15 minutes pass, which feels like an hour, the pain increases and I know I must retire to my room. I excuse myself and am chided for leaving the party. “Where are you going, you never leave early! We are just getting started!” I continue to the elevators, ignoring the remarks from the gallery. When I reach my room, I drop on the bed and never move till the alarm jolts me out of a deep sleep. I still have severe pain and feel extremely fatigued, but that doesn’t stop me from dressing for the day and proceeding down stairs to share my birthday with many of my dearest friends and colleagues. We enter the main conference room and take our places. Now I am sitting amongst nurses who work throughout the company. The meeting starts with welcoming comments and the room starts to spin and my head pain intensifies. I conclude it is a result of the bright fluorescent lights. I put my head down and pain shoots down my arm and the right side of my face goes numb. I am frightened and think of stroke or heart attack. I raise my head and cannot focus at all. One of the nurses observes my behavior and the sudden reddening of my face. She gets my attention and gestures that I follow her out of the meeting hall. I comply. I want to keep this low key, but that is now out of my hands. Several other nurses follow to see what is happening. They take my blood pressure and it is through the roof. The pain has increased and is now unbearable. The hotel quickly provides a wheel chair. This is getting way out of hand. “Please get me out of the lobby!” God forbid anyone see me like this, vulnerable and obviously getting sicker by the minute. Several people usher me to a back room, where I am given water and an ice pack for my head. Something is very wrong. “She needs to go to the emergency room immediately!” I refuse and truly just want to lie down and close my eyes. I agree to go to the Outpatient Clinic at Boston General. My good friend wheels me to the hospital which is just across the alley. We wait for hours, or so it seems. When finally seen by a doctor, she explains that I need a brain scan, since this could be an aneurysm or worse. I end up in the ER, so much for my plans. They take me back to the treatment area and I think this will all be over soon. Unfortunately, this is not the case. I’m escorted to a room at the end of a mesmerizing maze located near an automatic door which obviously was in high demand at the time. I lie on the gurney and every time the doors open, the pain sharpens to a monumental crescendo. I’m in tears praying someone will soon come and rescue me from this hell. After an interminable amount of time, a handsome young man comes for me and takes me to an exam room. Several tests are performed over the next few hours. My unmedicated pain has become excruciating. I continue my fall into the depths of despair. Finally, I’m sitting in a room full of patients, most of whom are on IVs and look relatively comfortable and pain free. My buddy from work, who was my angel throughout this ordeal, keeps reassuring me it will get much better once they give me the morphine. Even with my colleague’s assurances, I am doubtful it can resolve this killer pain. The nurse appears and sticks me for the IV and shortly after injects the morphine. To my absolute surprise and relief, it works — not only on my physical pain, but my mental and emotional angst as well. The hospital requests I stay for additional tests. I want and need to be home with my family and have the tests performed by my own doctor. Once I receive the approval to fly, I am discharged with pain killers and the next morning I am on my way home. Little do I know that my life would change in every way, except for my husband, who remains steadfast and true throughout the entire ordeal. At home, my doctor tests every part of my brain and major organs; fatal diseases are ruled out. Months pass, I sleep most of the time; when conscious, I’m in pain, nauseated and exhausted. I have severe joint and head pain which remains untouched by medications. My thoughts are erratic and words can’t be found. I lose entire spans of time. Speech no longer flows. I open my mouth but the words are nowhere to be found. I actually cannot find even simple words and it is difficult to communicate. I am frightened and fear this will be a permanent disability from this devastating, unknown (at this point) internal enemy. This continues for several months. Life is somewhere between a blur and a hellish nightmare. Friends come and go. My son, then 20, comes into my room and sits on the bed. He just sits with me since speech is difficult so we sit in silence. My little Chihuahua never leaves my side. I am given every test imaginable for my brain and heart with no positive results. My symptoms are worsening and my mental state is plummeting. My doctor decides to test me for a variety of diseases, including MS, Meningitis, AIDS and Lyme. All tests return with negative results. It has been 9 months and I am no closer to a diagnosis than I was back in Boston. No matter where I am referred, there is no validation for my symptoms. I see several Neurologists in hopes of assistance with my cognitive issues. The first doctor said it was totally in my head and that he could nothing for me. I went to a major hospital for my second neurological opinion and was given the basic dementia quiz. I am asked my name, the president’s name, the year and where I live. This is degrading and I explain the deficiencies have more to do with executive cognitive function. I was dismissed with no diagnosis or validation. I also had cardiac pain, so my next stop was the Cardiologist. X-rays were taken and I was diagnosed with carditis (often associated with Lyme), yet no further, overall diagnosis. I fear they see me as a fraud. That, together with my isolation and lack of physical activity, propels me into emotional despair. My doctor recognizes my depression and recommends psychiatric treatment and medication. I’m standing on the edge of a dark abyss. The quest continues with visits to a rheumatologist for joint pain and a cardio specialist for the dizziness and disorientation. Each one found issues but no overall diagnosis. So my doctor becomes more suspicious regarding Lyme Disease being the culprit and she initiates intensive research. She prescribes the accepted protocol of Doxycycline for the maximum time allowed according to the established protocol. There is no relief or lessening of symptoms. Time passes and I am lingering in the limbo of exhaustion so intense I rarely move from my bed and the pain and cognitive loss continues. At this point, a friend is in a chiropractor’s waiting room and hears a mother discussing her daughter’s symptoms that have been diagnosed as Lyme Disease. Since her symptoms mimicked mine, my friend inquired regarding her course of action to attain that diagnosis and treatment. The mother says they found an experienced Lyme Literate Doctor for a more complete and thorough testing. That family became our guide through a maze of holistic and therapeutic remedies and therapies once my diagnosis was affirmed by Dr. Silver (names are changed to protect the innocent). He sent my blood to a California laboratory that tested with great specificity for the numerous bacteria and parasites associated with Lyme Disease. This test confirms I have several forms of this misunderstood disease. I feel relief that I finally have a diagnosis but due to the lack of studies and support of the AMA and CDC, there is no cure or protocol for Chronic Lyme Disease. Any acceptance of this chronic form of Lyme is in its infancy perhaps embryonic stage is more precise. Some doctors are under investigation since they acknowledge Chronic Lyme and venture outside the box to find protocols and procedures to lessen the symptoms and ultimately to find a cure. The first aspiration is achieved but they have yet to discover the cure. My husband and I continue investigating this overlooked and devastating disease and find there is much controversy. This is the disagreement: AMA and CDC do not recognize Chronic Lyme, although another group, the International Lyme and Associated Diseases organization has research to prove its existence. These brave Lyme Literate Doctors proceed to help the patients with this disease. I am on a 30 day IV antibiotic protocol (at home), the insurance companies do not recognize and do not cover the costs incurred. I realize some relief of severe joint pain and minimal to no relief with word retrieval, foggy brain, disorientation and excruciating head pain. I also pursue Holistic approaches that seem reasonable to me and are touted as helpful in breaking down bacteria and parasites and possibly assist in killing the organisms. At this point, I am sick for over a year and have seen very little relief of my symptoms. My fabulous doctor and I continue our researching. Joint pain, headaches, confusion, disorientation, articulation problems, word retrieval, lack of concentration and extreme exhaustion continue. We keep an open mind and move forward. Back at my job, I utilize my short and subsequently long-term disability. I feel responsible for the colleagues on my team who count on me, but I’m unable to perform simple tasks. In August 2011, I receive a phone call from my manager and the head of HR. I know both of these people very well, yet I’m treated as a stranger in a strange land. I’m fired “due to illness.” I am in management and worked for this company for almost 30 years. I am let go with no insurance, no paycheck, no benefits and no package. Employee pensions were frozen years prior and by now are almost nonexistent. I’m truly lost at this new development. I can’t believe that day in 2010 is the last time I will see my fellow workers or receive another substantial paycheck. I am career woman, mother, organizer…….my identity is drifting away. I am lost. We move from our beautiful home. Our multiple gardens prove too much for my husband who is also my major care giver. I lie on my bed as friends pack and sort our belongings. I am so blessed by the friends in my life that carry me through this desperate time. We move and I continue to suffer debilitating symptoms. Constantly researching, we find a clinic in Kansas that specializes in working with Chronic Lyme. I go for 2 weeks and receive daily treatments to detoxify, rejuvenate, nourish and reboot my immune system. I improve significantly yet that joyful reprieve lasts but a month. At that juncture, I descend into the former symptoms and once again fall into despair. I seek out nutritionists, herbal specialists, and continue to see my LLMD (Lyme Literate Medical Doctor). I do detoxing using various treatments which sometimes helps, yet often has the opposite effect. Numerous other antibiotics are tried as well as acupuncture and chiropractic treatments. After 5 years, I receive some relief from each treatment for a period of time and then the symptoms return in varying degrees. I may enjoy 2 or even 3 (sometimes) good days, meaning I can do one or two activities. After this brief respite, I am thrust into extreme exhaustion, exhibiting joint pain and headaches with flu like symptoms, fever and cognitive loss once again. This continues from 2 to 5 days. So my life is totally changed as far as my career, my income, my home, my activity level and my self worth. This devastating disease is finally stepping out of the dark but we are continuing to work to shine light on it and bring it to the limelight (or should I say Lymelight). We are Lyme Warriors fighting for our lives. Little by little we are being heard yet Lyme Disease is at the stage that Aids was in the 1980s: disbelief, denial and people suffering unnecessarily. Insurance companies utilize the attitude of the AMA and CDC to refuse payment for any treatment or prescription over and above the first weeks of antibiotics. John’s Hopkins Hospital has begun to look at Lyme and that is a start. There is a long way to go. The Medical Community must intensify research and acknowledge Chronic Lyme as a disease. I go to a Lyme support group in my area. The immediate benefits are validation, understanding, sharing research and ideas that show significant results. We continue searching for some permanent relief. We need to stay focused and work together, one day at a time. We are not alone, yet often lonely in our isolation and continued symptoms. 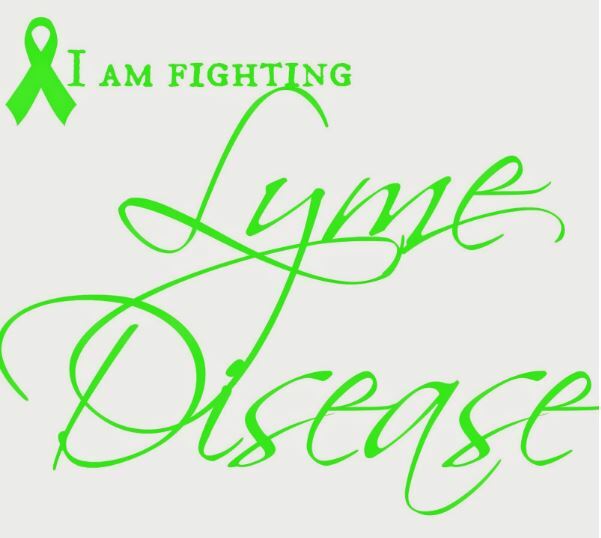 It is now 2016 and I continue to suffer from Chronic Lyme Disease and continue my search for relief, ever hopeful for a cure.